As much as I love half marathons, the next favorite distance for me is the 10K, or 6.2 miles. This is not an event you see frequently, so I (almost) always take advantage and register if I can find one nearby. Sunday, April 28th was the date and the location was at Drake University in Des Moines, IA. 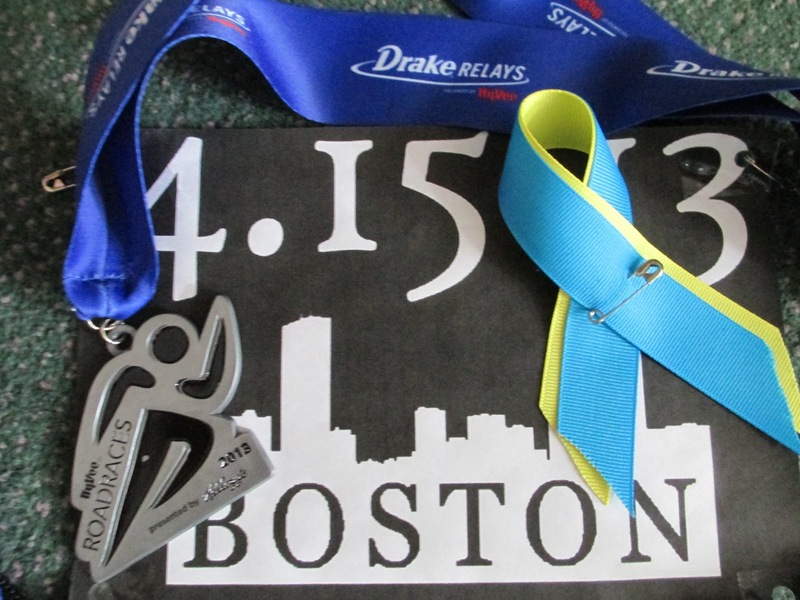 Every year, Drake hosts the famous Drake Relays, which attracts elites, professionals, collegiate and outstanding high school athletes from near and far. They also have events for average folks, like myself. This year there was a 6K, 10K and a half marathon to choose from, and all took place on Sunday morning. Since I have had some piriformis discomfort issues, and have been taking it pretty slow and easy working my way back, I elected for the 10K instead of the half marathon. This is a distance I truly enjoy racing. As I have said before, I am not a super fast runner, but I can hold a decent pace for 6.2 miles. The 10K is a bit of a challenge because it's not really a short distance (it's a bit too far for the average non-professional to sprint), but it's short enough I don't have to be too concerned with running out of energy for the duration. 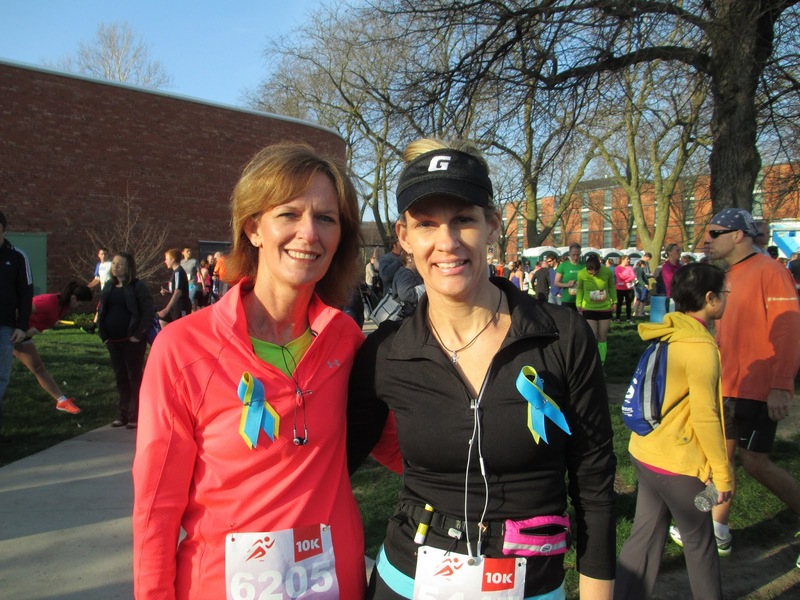 I was lucky to have a fellow runner friend, Barb, to ride to the race with. 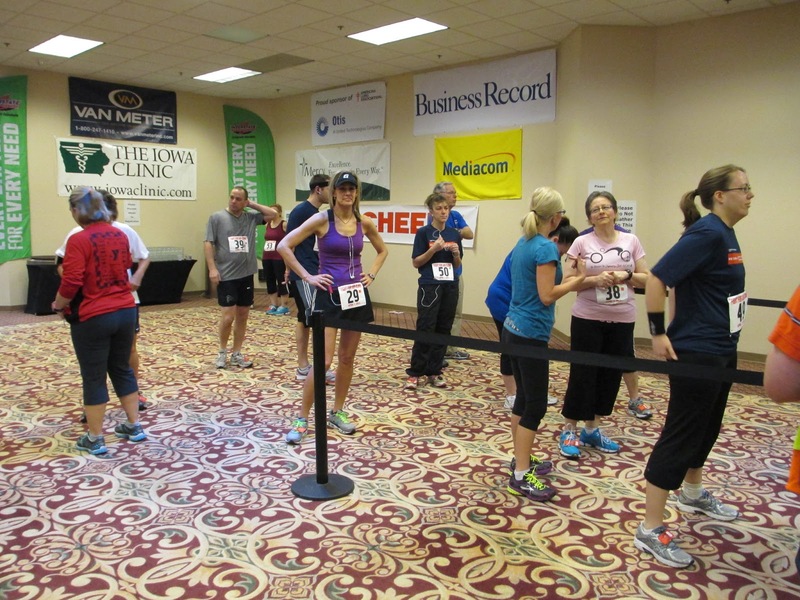 Des Moines is approximately an hour drive from our town, so we were on the road at 5:45AM to allow time for parking and packet pick-up before the 8:00AM start. We scored on a great parking spot 2 blocks from Drake Stadium. The race would start outside the stadium and end inside, on the famous Blue Oval (the blue colored track). The packet pick-up went smoothly, except for the fact that I had to settle for a medium-sized unisex shirt. Grrrrr. I registered three months ago, and requested a small size......but some other person (luckier than myself) got the last small shirt. This is a huge race-day-annoyance of mine, and this is not the first time it has happened. I am not a race shirt collector, but I think if you have the racers list their shirt size on the registration form, the racers should RECEIVE that size. In addition to the (oversize) shirt, we also received socks and a nice draw-string bag. If I was an avid race shirt-wearer, I would have caused a small scene, but I chose to just let this go. 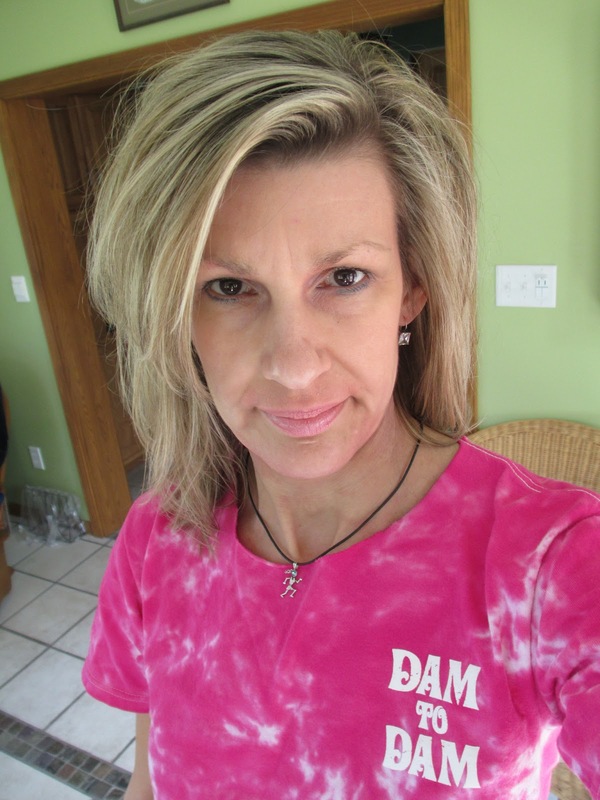 One of my kids might like the shirt, and it would probably fit my husband as well. 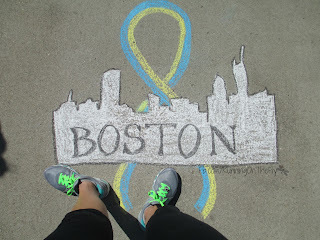 Even with the recent events of the Boston Marathon fresh in my mind, I couldn't help but feel that race day excitement. There's something about pushing through the crowds of fellow runners that gets my heart pumping. Barb and I wore the Boston bibs on our backs, and I also made us blue and yellow ribbon pins. This was my first official race since Boston, and I was excited and ready to hit the road. 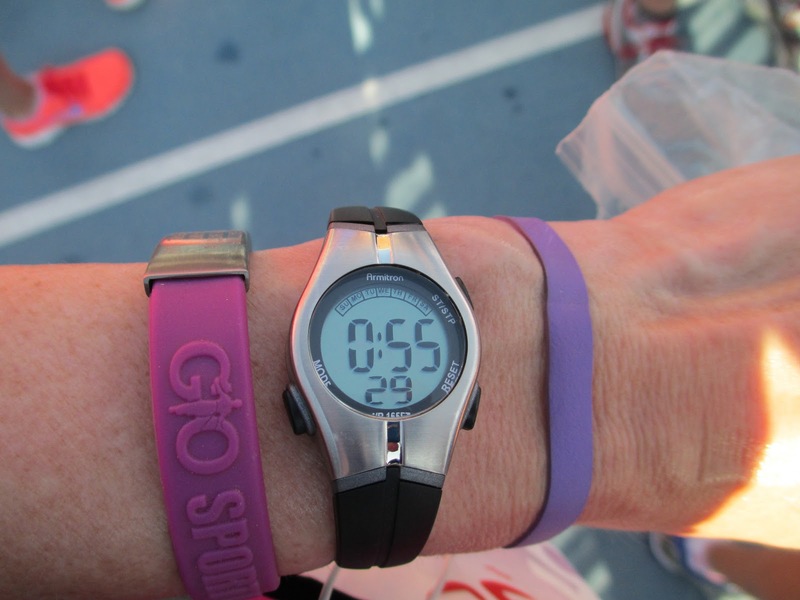 My fastest 10K finish time is 53:46, so that number floats around in my mind whenever I run a 10K. This day was no exception. Drake University is situated within a neighborhood of hills, so I knew this course would not be flat or fast. And I knew the ole piriformis could flare up at any time. After a moment of silence for Boston, and a beautiful rendition of the National Anthem, we were off and running. The weather was perfect, in the low 60's, and there was plenty of sunshine. The 10K and half marathoners started at the same time, so it was a little crowded for the first mile as we slowly spread out and headed toward the streets of downtown Des Moines. My watch is a very basic sport watch. It allows me to time myself, and that's about it. It doesn't tell me how far I've gone, or even in which direction (I am a technology idiot, so this suits me fine). There were water stations, but I didn't see any mile markers to know how far we'd gone. I estimated my first mile to be around an 8:20 pace, which is a bit fast for me, so I knew I needed to take it easy. I hit the second water station, which I think was before the 2-mile mark, and still was unsure of how far we'd run. We were still gong downhill, so there was bound to be a change of direction pretty soon. Finally, there was a sign for the halfway point, and my watch said I had been going for approximately 26 minutes, just under a 9-minute pace. I'm usually around 8:30-8:45 pace, so I was doing alright. Hoping for a negative split, I gulped some water and took off, eager to finish the remaining 3.1 miles strong. I passed the 4-mile marker, and turned a corner....to see the start of the uphill climb that would take us back to Drake Stadium. And this climb was pretty steep, and pretty long. UGH. I knew this was coming, but didn't expect it to be so sudden and so forbidding. Thankfully, this took us through a residential area, so there were people along the curbs and on their porches waving and cheering. I make it a habit to run hills when I train, so I am no stranger to the mental toughness one needs to run them. This particular hill was a beast! It was probably 5-6 city blocks in distance, but felt much longer because of the steep grade. I made it up most of the way, but walked the final block or so. A lot of fellow runners walked it as well. A little game I play with myself is if I allow myself to walk, I have to resume running before I reach the top of the hill. There's something about running over the crest of a hill that makes you feel like you really conquered it, even if you didn't run the entire way there. This conquest was short-lived, though, because a few blocks later, probably around the 5-mile mark, we turned a corner and had another hill waiting for us. This second hill was not as steep nor as long, so I was able keep running. I think the second hill actually gave me a much-needed second wind, because I felt a surge of energy after finishing it. Soon after, I knew the end was in sight. I could hear the roar of the crowd near the finish line and my natural runner instinct kicked my legs and feet into high gear. We turned onto the street in front of the stadium and ran a few blocks, before running into the stadium itself...and onto the Blue Oval. To see the stands filled with people cheering is pretty awe-inspiring! For a brief moment, I had a glimpse of what it might actually feel like to be a world-class runner, as I sprinted to the finish line. I have run many races. 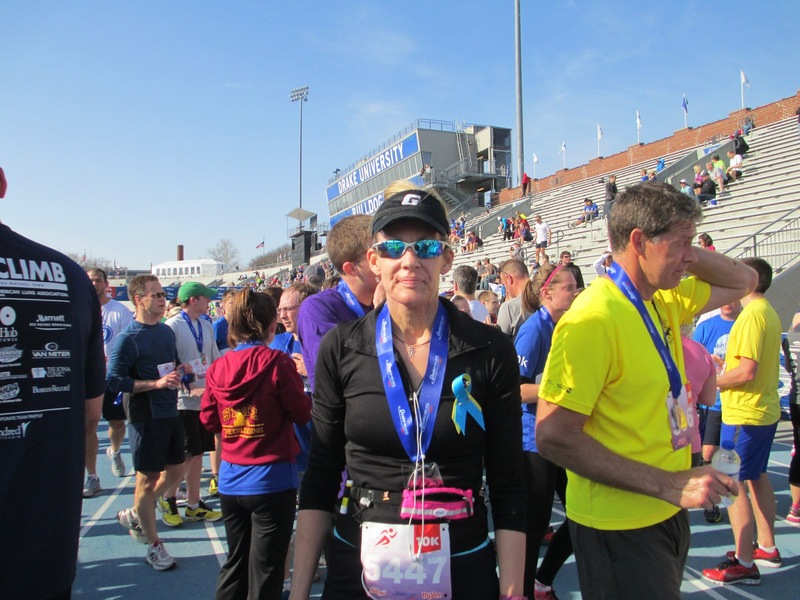 Half marathons, 20K's, 7-milers, 5-milers, 5K's, and now another 10K. No matter the distance, every finish line feels euphoric to me. It seems there's always someone (usually a stranger, but a fellow runner none-the-less) who will congratulate me or give me a high-5. And, I am always honored to do the same to someone else. I finished with an official time of 55:39, just under a 9-minute pace. Not a PR, but I'm happy with it. Given the fact that there were some treacherous hills, and I had to walk briefly, my finish time is still respectable for someone not blessed with intense speed. My official stats said I placed 498th out of the 1317 who ran the 10K. 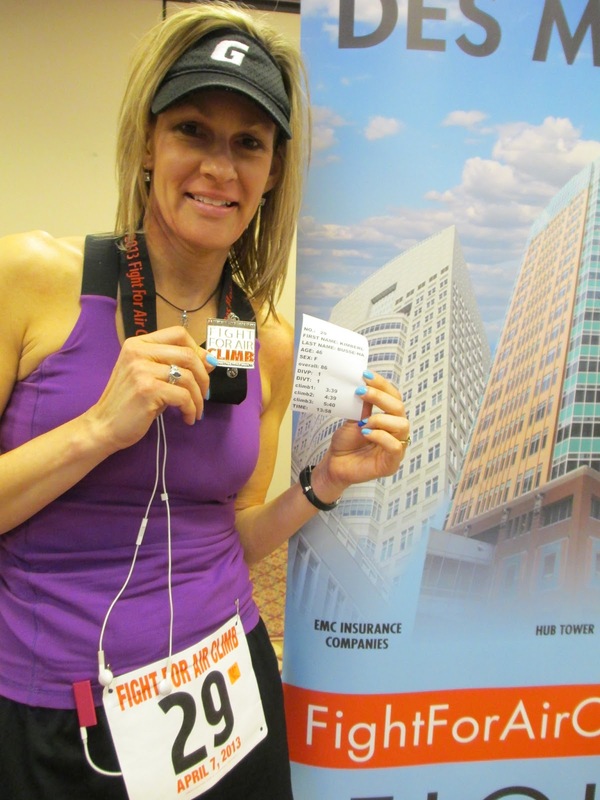 I was 12th in my age group (out of 56 ), and I finished 184th out of the 727 women racing against me. I even had another racer ask me about my Boston bib...and they wondered if I had ran the Boston Marathon. I had to laugh, but I was flattered to think someone actually thought I could have been a marathoner, and a Boston marathoner at that. It's been a crazy week. Lots of emotions experienced, some suppressed, and many are still raw. Last weekend started off a little crazier than most. I have been on the After-Prom/We Care Committee for 3 years, so this is my 4th time orchestrating the Presentation of Couples. Myself and a couple friends design a some-what elaborate stage for the prom-going couples to walk across as they are introduced to a full house of friends, family and community members. It's a lot of last-minute stress and work, but the art geek within me LOVES doing it. And my handyman husband always gets recruited to help assemble the set to closely resemble the design I have envisioned. That was Friday evening. 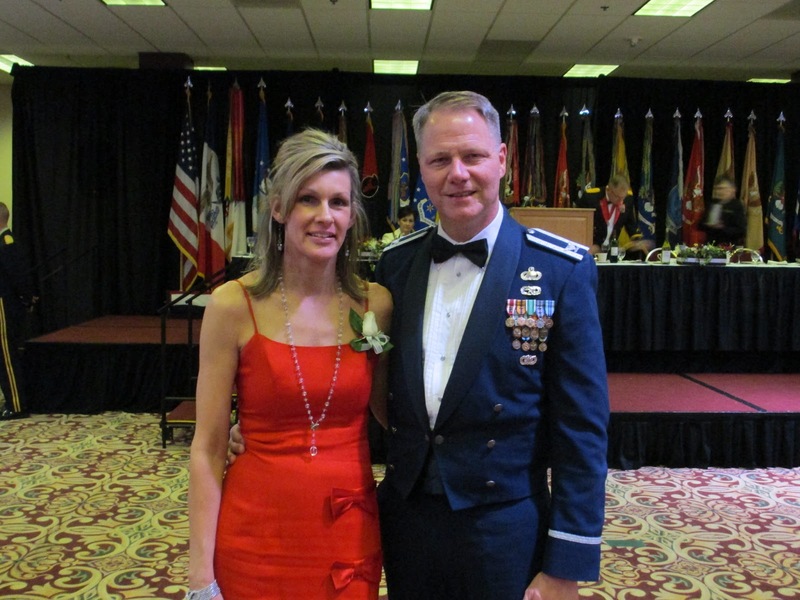 My husband recently retired from 32 years of combined service in the Air Force, Iowa Air National Guard and Michigan Air National Guard. As luck would have it, the annual dinner (with the Lieutenant Governor of Iowa) honoring all 2012 retirees was on Prom night...at the exact hour of Presentation... in a grand ballroom setting...an hour away. Thankfully, my committee was well-equipped to handle all the details of Presentation, so the husband and I were able to attend the dinner and celebrate with all the other retirees. That was Saturday evening. Upon the conclusion of the banquet, we headed back to town. Our evening was far from over, because both of us were also scheduled to work at the After-Prom party. The After-Prom festivities began at midnight and lasted for several hours, a successful endeavor that kept most of the students safely in town following the dance. That was (the wee hours of) Sunday morning. After several hours of much-needed sleep, I ventured out to do my daily run. I have been obediently doing a daily run challenge for April, and this was not going to suffer. Surprisingly, the run went well, complete with a negative split. That was Sunday afternoon. 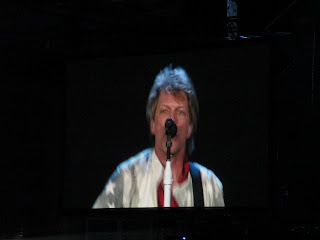 Next on the weekend's agenda was a concert. And this was not just a concert, this was Bon Jovi! 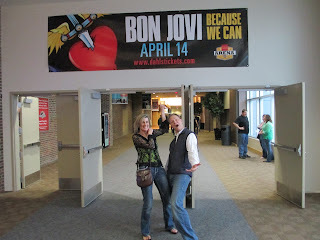 Myself and some gal friends have seen this amazing band in concert twice before, and this time we convinced the husbands join us, albeit reluctantly. 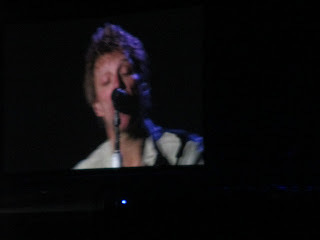 The music was great, the stage show was out of this world, and Jon looked most amazing. That was Sunday evening. The next day was the Boston Marathon. This is an event that I had been looking forward to for quite some time, since I knew several Facebook friends running in it. Like so many others, I was excited to see some of the marathon on tv and follow the progress of my fellow runner friends. That was Monday morning. Hearing about the explosions at the finish line brought me to my knees. This was not supposed to happen. This was supposed to be a day of celebration. This was a day all of these marathoners had been preparing for, all of them had friends and family along the route, all were prepped and ready for a celebration. Instead, chaos broke out. Runners halted. Spectators injured. Innocent killed. Suspects on the loose. That was Monday evening. As the week progressed, the running community solidified. We joined hands. We wore our race shirts. We cried, mourned and reflected. 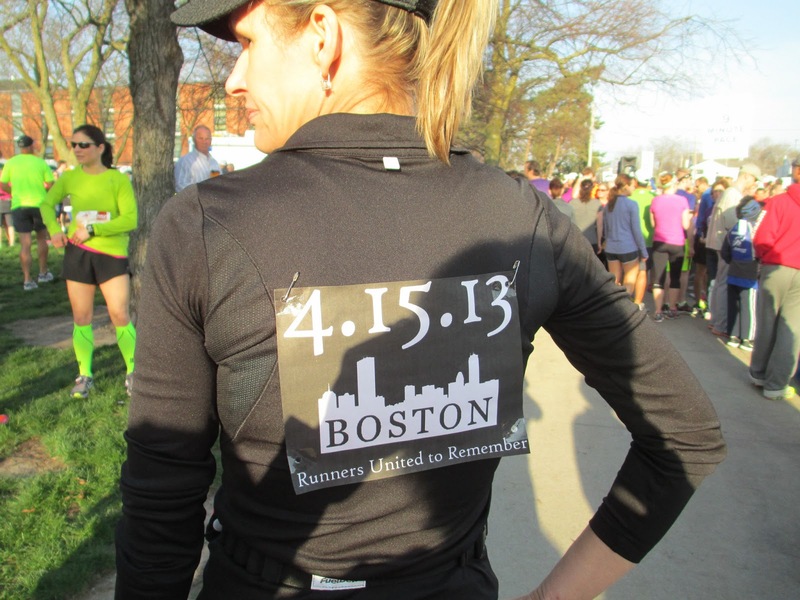 And, most importantly, we ran for Boston. That was last week. As a runner, I have run in many races. And I have crossed many finish lines. This could have happened anywhere, and it could happen again. But, like most runners, I refuse to stay inside on my treadmill. I have run outside every day since this tragedy, and I will continue to do so. I will continue to race. I have a 10K next weekend, and I look forward to crossing that finish line. It will not only be a victory for me, but for Boston as well. This is today, and I eagerly look forward to tomorrow's run. 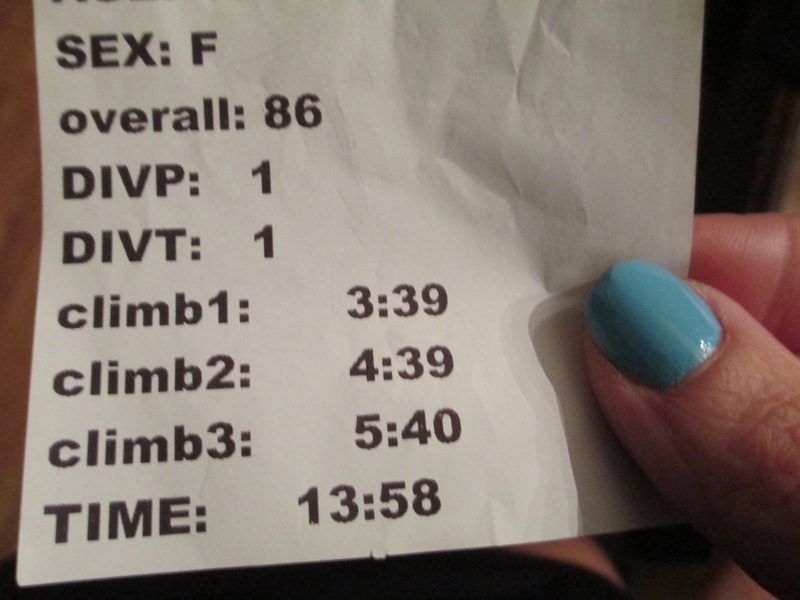 I ran my first-ever "vertical" race today. And it was an incredible experience! 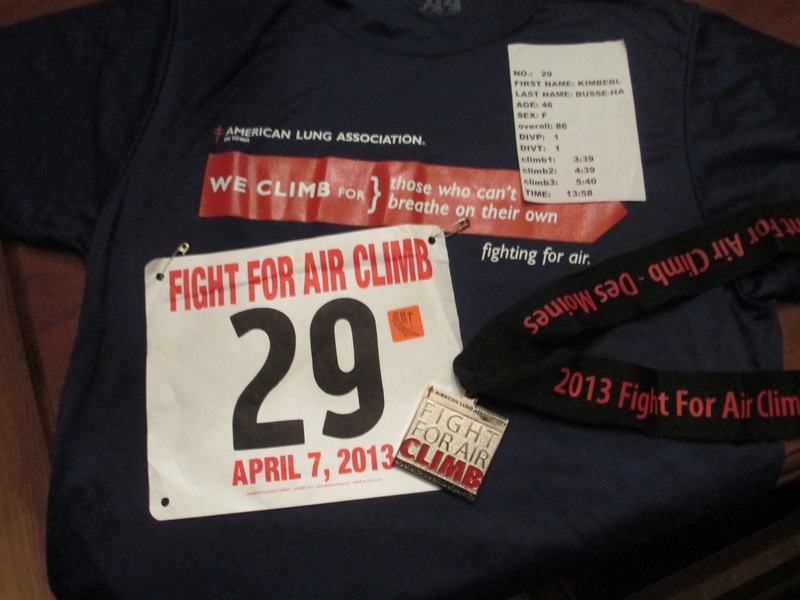 The Fight for Air Climb is an event where the participants race up stairs, raising funds for The American Lung Association. 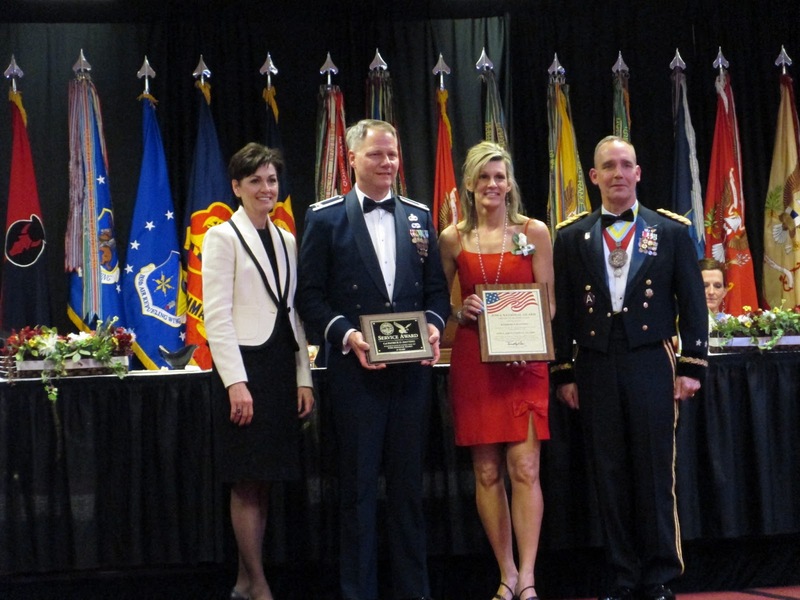 It is a national event, and I took part in the one located in Des Moines, Iowa. 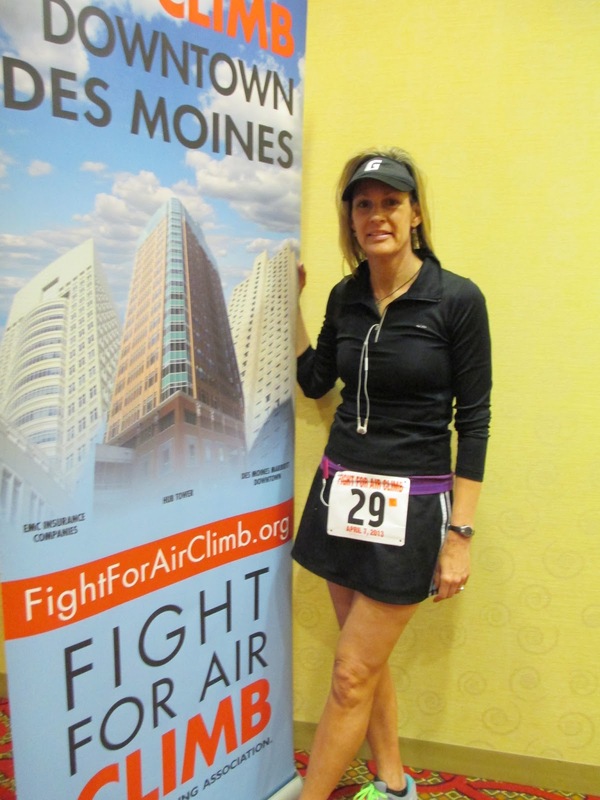 I have a passion for fresh air and fitness, and this was a perfect opportunity to not only violate my comfort zone (no, I had never attempted to climb 66 flights of stairs and, yes, I was up to the challenge!) but also a chance to show my support for this organization. I assume it is similar for each event, but for the Des Moines location, each participant was required to collect a minimum of $100 in donations. It seemed a little intimidating, but I also think it helped to weed out the devoted racers from the others. I have wanted to to this race for several years, and I always seemed to see it on the news after the fact. This year, I was able to find it online early and register on time. The Des Moines venue utilized three tall buildings: the EMC Building, The Hub Tower, and the downtown Marriott, all of which are connected by the city's sky walk system. 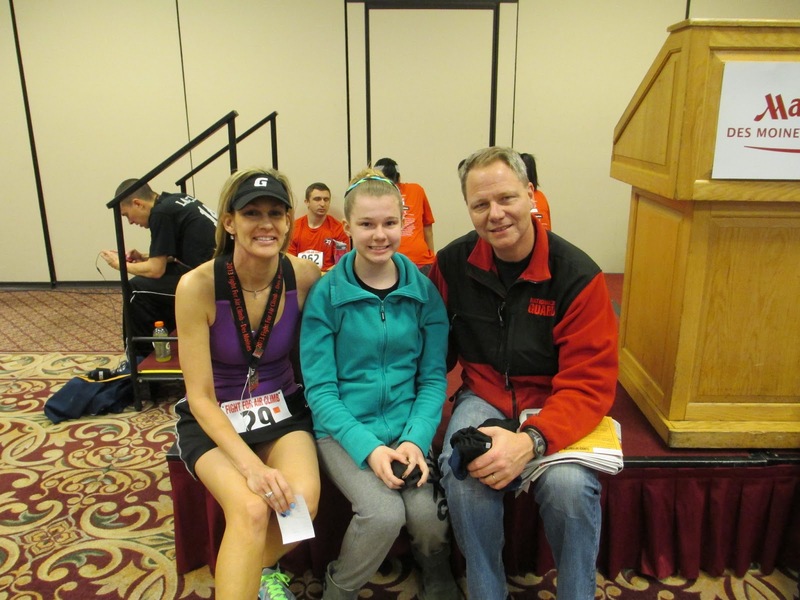 Racers were to report at 7:30AM to check in, get their bib numbers and receive their timing chips. We were lined up in waves, and each wave had a different "departure" time, and there were 10-second intervals between the start times of each racer. I raced as an individual, but there were many teams from various clubs, businesses, friends and families. There was a Kids Climb, where the youngsters could climb just one of the buildings. There also was a Law Enforcement Challenge and a Firefighter Challenge...and these racers ran in their full gear (one firefighter I talked with told me his gear weighed about 40 pounds). I was impressed with how well this was organized and the numerous volunteers were wonderful! I think I was a bit too excited. I started way too fast on the first building, taking the steps two at a time and going pretty fast. By the 8th or 9th floor, I slowed down. I continued taking the steps two at a time, but didn't "run" these as fast. We were told there would be photographers taking our pictures in this first building, so I tried to smile when I saw the flashes of light. There were numerous volunteers on each landing, cheering us on and handing out water bottles. I made it to the top of the first building in 3 minutes, 39 seconds and quickly grabbed some water as I walked to the elevator, to head down and make my way to the second building. The second set of stairs went much easier. I took the steps two at a time, but on these steps I used the hand rail. It gave me a little more balance, and something to "push-off." I was very thankful not just for the volunteers and their encouraging words,but also for the fans blowing in the stairways! There also were lots of posters with inspiring quotes to keep us motivated and moving. I finished the second building in 4 minutes, 39 seconds. I rode the elevator down, enroute to the third building, with 4 or 5 fellow racers, and all of us were laughing at each others' labored breathing and sweaty faces. There's nothing like a stair climbing challenge to bond with strangers! The third building was the tallest, almost twice as tall as the two previous buildings. Racers had the option of doing one building, two buildings or all three, but had to do them in sequence leaving the tallest building for last. Ironically, this last building seemed to be the easiest. Maybe, by then, I was thoroughly warmed up. Maybe I was using the hand rail more effectively. Maybe I knew how to utilize those 5 seconds on the landings between the floors better. Whatever the reason, this last building was where I really rocked the stairs, finishing in 5 minutes, 40 seconds. I didn't know what to expect going in to this race. I am tall, I have long legs, and it's second nature to take the steps two at a time. I had trained on my own stairs...taking those three at a time, able to complete 50 sets in less than 15 minutes. I was hoping to finish in 20 minutes, but secretly was hoping to do it in 15 minutes...and my official time was 13 minutes, 58 seconds! We didn't stick around for awards, but when I had this time sheet printed, it said I was in 1st place in the women's division, and also 1st in my age division. There were many still climbing, so I haven't yet heard if my lead spot has held. Like a lot of races, this started out with myself wondering why I wanted to take on this challenge. Climbing steps (especially 66 flights of them) is not easy. When my legs were starting to feel tired in the first building, I had a split second of doubt, wondering how much I would really need to slow down to finish and complete two additional buildings. Then, the confidence returned, reminding myself that I have run 13 miles over the course of two hours without stopping.....this would be over much sooner than that. My legs are strong from all the running I do, my lungs are strong...just keep climbing! And that made me remember what this climb was all about, we were climbing for those who aren't able to breathe on their own. I am lucky to have a healthy set of lungs, and it was an honor to contribute to this cause. I not only look forward to returning next year, as an "alumni," but I plan to "step-up" my fundraising and surpass the minimum. Fair warning to you all! 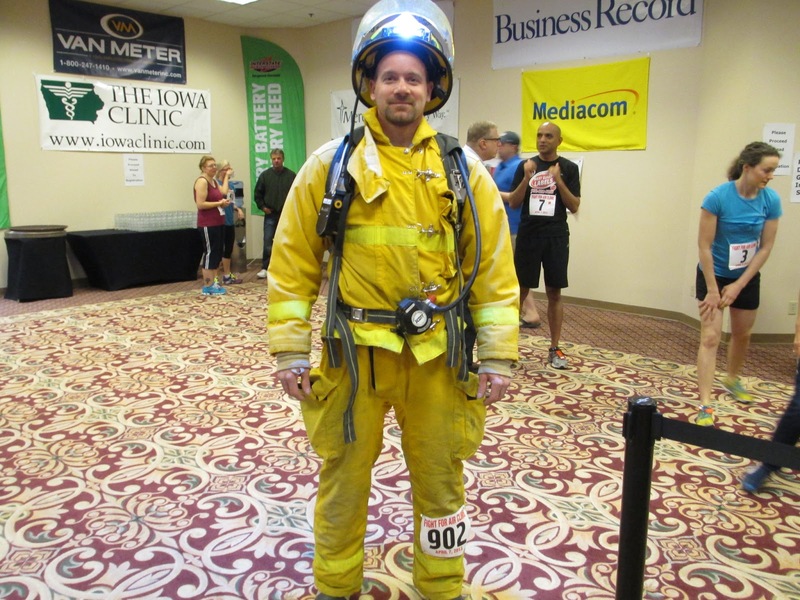 Have you ever done a stair climbing event? Step it up, and give it a try!